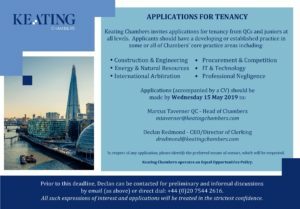 Declan Redmond (CEO/Director of Clerking) dredmond@keatingchambers.com. Prior to this deadline, Declan can be contacted for preliminary and informal discussions by email (as above) or direct dial: +44 (0)20 7544 2616. All such expressions of interest and applications will be treated in the strictest confidence. In respect of any application, please identify the preferred means of contact, which will be respected. Keating Chambers operates an Equal Opportunities Policy.